Football season is back! That makes me a happy girl. I will be the first to admit that some of that happiness is because of all the game food that I will be having from now until February. Wings, ribs, pizzas, calzones, guacamole, chips and salsa, anything dripping in gooey cheese, and one of my favorites: Lipton Onion Dip with Cape Cod Chips. I don’t know what it is about that dip and those chips together that make me go bat crap crazy. But I do know what it is that makes my clothes a little tight come Monday morning during football season. I’m not going to eat a salad while the Patriots score yet another touchdown. (Well, unless that salad is in a big, deep-fried tortilla and covered with cheese and some sort of creamy dressing.) I know game food isn’t typically healthy, but it can be. 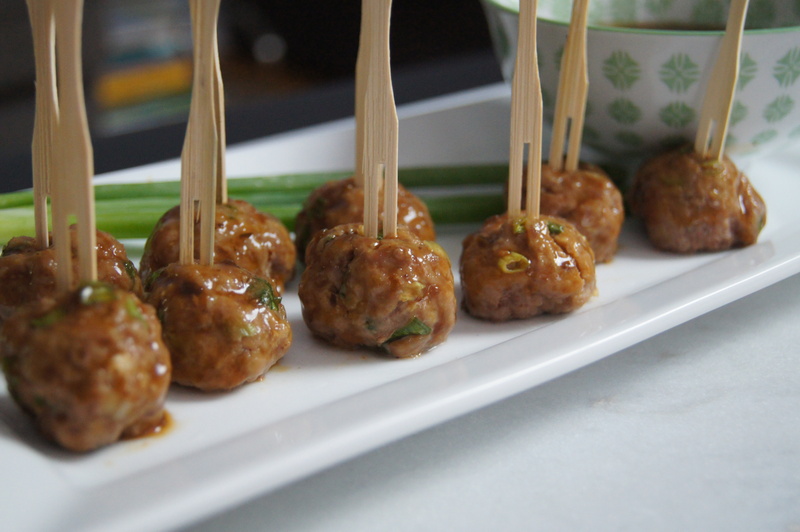 And that’s why I love these Ginger Scallion Pork Meatballs. They are easy to put together and dipping them in Trader Joe’s Gyoza sauce (or a homemade sauce that I’ve included below) is so delicious. I also love that you can pop a bunch in your mouth while you’re watching the Patriots intercept the ball and run it into the end zone for – whaaaat?! – another touchdown! As you might know, I’m a big fan of Chinese food and dim sum. 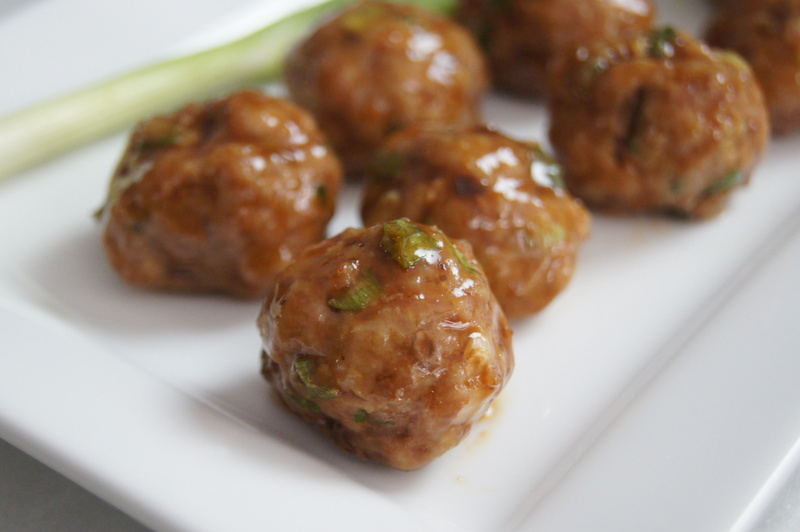 These meatballs taste like the filling of Peking ravioli, which is pretty incredible in my book. What’s also great about these meatballs is that you won’t feel any guilt if you look at your plate and lose count of how many meatballs you’ve enjoyed in the first quarter. If you’re making this for a big crowd you might want to double the recipe since they go fast. 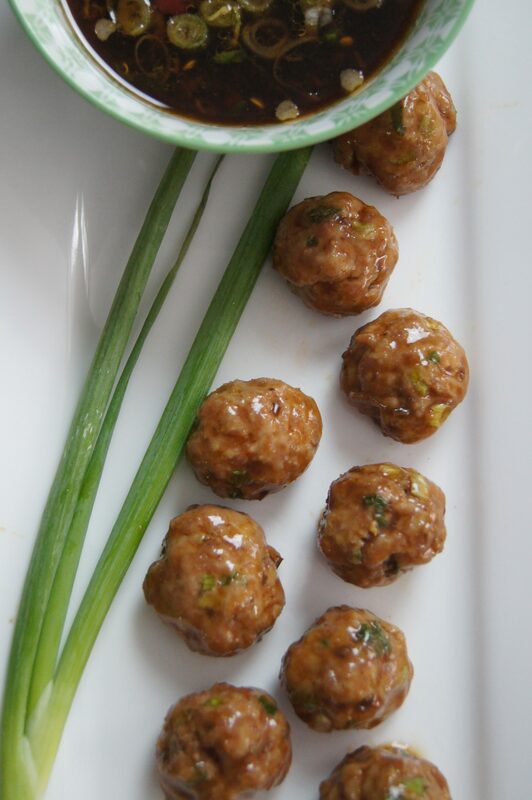 Aside from having these meatballs on game day, they also make a nice lunch or dinner. And it’s perfect for meal prep. They’re a good and complete meal along with some rice or cauliflower rice (http://www.thetastypage.com/cauliflower-fried-rice/) , stir-fried vegetables, or zucchini noodles. Go Pats! Brady was screwed and I can’t wait for him to come back. As you can probably tell, I’m a Patriots fan. If you’re outside of New England chances are you probably are not (but if you are, yay!). But that’s OK. We can have these meatballs together on Sundays and see the best teams play…and easily fit into our clothes come Monday morning. Preheat oven to 400. Line a sheet pan with parchment paper (or lightly grease with coconut oil). 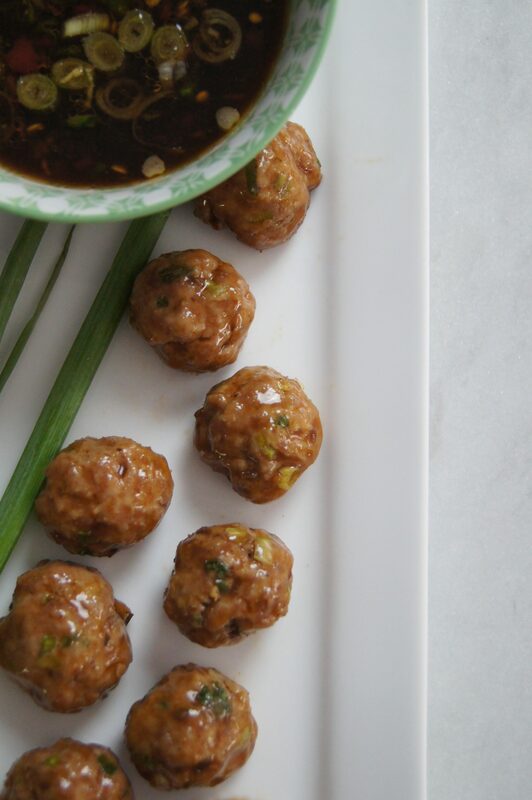 In a medium bowl, combine the coconut aminos, sesame oil, fish sauce, ginger, scallions, and coconut flour. Whisk to combine. Add the ground pork and mix with your hands until incorporated. Dampen your hands and form into 1-1 1/4 inch balls (I used a small cookie scoop). Place the meatballs on the prepared baking sheet. Bake for 15 minutes, until cooked through and golden. Combine all ingredients & mix together, adding more if needed.